The marine industry continues to look for ways to attract skilled labor . During a visit to Yamaha’s Precision Propeller Industries facility, students got to try out some equipment. After his dad bought a powerboat from MarineMax in Norwalk, Conn., Bennett got a job there washing boats and answering phones. He went to college, majoring in computer science and engineering, and worked at a marina gas dock, where he asked technicians questions, operated machinery and put together engines. Then he dropped out of college to become a marine technician. 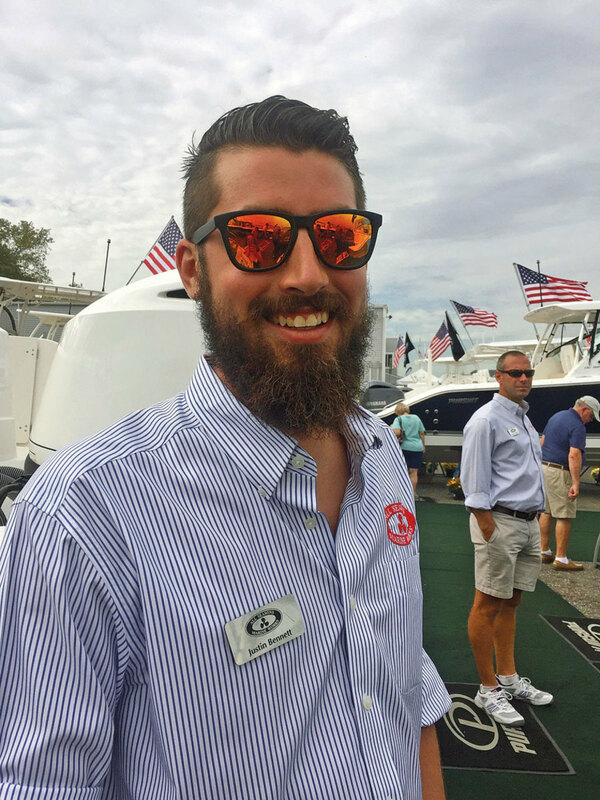 Today, the 27-year-old is debt-free and makes about $80,000 a year as a certified Yamaha technician at All Seasons Marine Works in Norwalk, Conn. He also services boats on the side. The cyclical nature of the business isn’t a problem. During his winter month-long break — which he wishes was longer — he maxes out unemployment and takes a vacation. During summers, he often delivers boats to places like Nantucket, Mass., and Long Island, N.Y. There is no estimate of how many skilled labor jobs the recreational boating industry’s manufacturers need to fill, but a workforce assessment that the Marine Retailers Association of the Americas conducted two years ago found that marine dealers would have at least 31,000 service technician positions unfilled by 2019, says MRAA president Matt Gruhn. The industry is growing at around a 6 percent clip, a pace that is projected to last through 2018. But Gruhn fears a slowdown if people can’t get the boats they want, power them how they want or service the boats and engines they have. If consumers are making payments on a boat they can’t use for a whole season, there’s more of a chance they’ll leave boating, he says. To address the concerns, the MRAA partnered with the Rhode Island Marine Trades Association to develop an industrywide workforce development plan, Gruhn says. At the Progressive Insurance Miami International Boat Show, CEOs and presidents of manufacturers including Cobalt, Correct Craft (which includes seven boat brands and an engine brand), Marine Products (builders of Chaparral and Robalo Boats), Evinrude, NauticStar and S2 Yachts (builders of Pursuit and Tiara) all cited the skilled labor shortage as the No. 1 industry challenge. And the marine industry is not alone. During the next decade, 2 million manufacturing jobs overall are expected to go unfilled because of the skills gap, according to a 2011 analysis by Deloitte Consulting and the Manufacturing Institute. Six out of 10 respondents said that skilled-production positions are unfilled because of a talent shortage, and that the rapid pace of changing technology compounds the problem. When asked to look ahead three to five years, respondents said access to a highly skilled workforce would be the most important factor in their effectiveness — a factor ranked above product innovation and market share by a margin of 20 points, wrote Craig Giffi, U.S. automotive industry vice chairman and the report’s author. Students at Yamaha University get to work on the latest outboard motors. About 10,000 baby boomers are retiring each day, according to Pew Research. There are fewer people to fill their jobs because people born in the 1960s and beyond believe the American dream includes a four-year-degree that leads to a “respectable career,” says Susan Zellers, executive director for the Marine Trades Association of Maryland. To help combat the stigma, California is spending $200 million to improve vocational education programs, and an additional $6 million to improve the image of such programs. Employers also are reconsidering how to deliver a career, rather than just a job, to millennial workers. As part of the Trump administration’s efforts to expand apprenticeships and close the skills gap, students enrolled in job-training programs that lead to industry-based credentials are now eligible for Pell Grants. Many community and technical colleges that offer short-term programs, however, don’t require enough hours to qualify for those grants, according to Pam Lendzion, executive director for the American Boat Builders & Repairers Association. Lendzion met last fall with senior officials at the White House and U.S. Departments of Labor and Commerce. She told them that without financial aid, some students can’t afford training to fill the growing job demand. In a similar vein, Yamaha Marine became an official apprenticeship program with the Department of Labor in April. It has outlined the required material for operating and conducting an apprentice program at authorized Yamaha dealerships, says Joe Maniscalco, service division manager for Yamaha Marine Group. Because the company is part of the federally authorized program, dealers can register to receive funding that offsets training and apprentice costs. Each state has different incentives for apprenticeships. For example, Minnesota will commit $5,000 for a dealer apprenticeship program. New Jersey will provide 50 percent of the apprentice’s salary for six months. Yamaha is building a database of what each state offers, says Ron Zastocki with Yamaha Marine. The product of an apprenticeship, Maniscalco says the program will bring structure to Yamaha Marine University and create a generation of mentors to help new apprentices. The company has worked with high schools and colleges around the country to implement marine outboard programs. “We’ve partnered with 53 schools nationally, and there are another 40 or 50 in the wings,” Zastocki says. Spearheading that initiative has been a ground-up process, says Yamaha Marine Group President Ben Speciale. When the company sought a training manual to share with schools joining the program, it could locate only the 1985 textbook Understanding the Outboard Motor, updated in 2002. Last year, the company created a new training manual for schools. Yamaha is also providing its newest engines to schools free of cost because the programs are so strapped for funds, Maniscalco says. With today’s high-tech outboards, learning to diagnose problems on a computer is a required skill. A recent Massachusetts Marine Trades Association conference focused almost entirely on workforce development. Frustrated dealers said that cultivating a new workforce largely has been left up to them. This year the Progressive New York International Boat Show and the New England Boat Show offered career days for high school and college students. In New York, 117 students attending marine schools listened to industry heavyweights speak about opportunities in recreational boating. New England drew around 100 students to its event, where Massachusetts Labor and Workforce Development Secretary Rosalin Acosta said students shouldn’t feel as if they need to choose between a tech school and a four-year degree. “You can leave the industry and choose to come back in a different capacity, or in the same role,” she said. 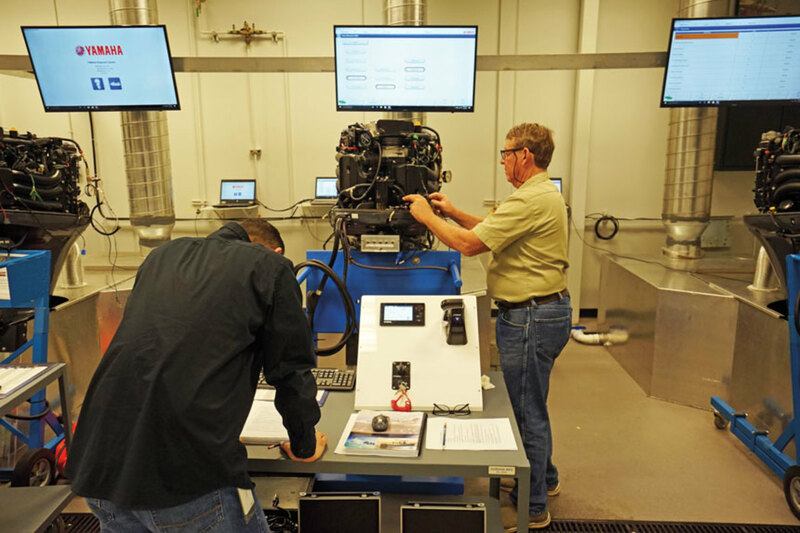 Such flexibility is a common occurrence in the marine industry, says Ed Lofgren of 3A Marine, where half of the 14 technicians have college degrees. 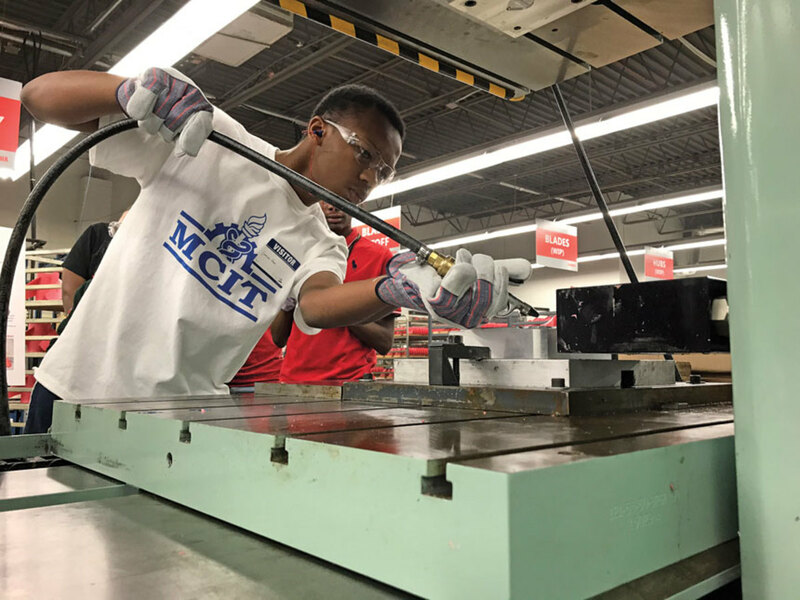 Marine companies also scheduled October events in conjunction with Manufacturing Day — offering plant tours and demonstrations, letting students cast metal, and reaching out to women. Tennessee-based Malibu Boats participated in the Loudon County Economic Development Agency’s first Manufacturing Day event, offering tours and a boatbuilding introduction to more than 60 high-school students. Correct Craft hosted around 200 students at Pleasurecraft Engine Group in Little Mountain, S.C.; SeaArk Boats in Monticello, Ark. ; the Bass Cat and Yar-Craft factory in Gainesville, Ark. 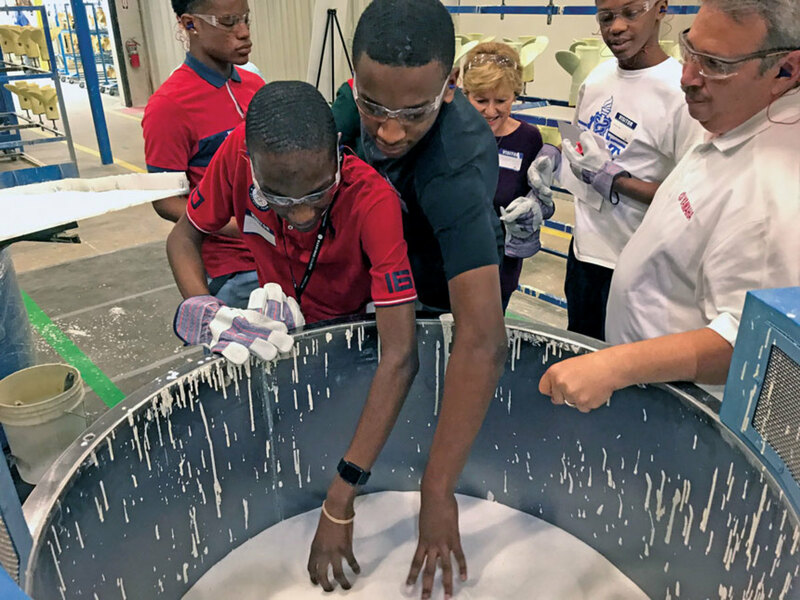 ; and Centurion and Supreme Boats in Merced, Calif.
Students get to feel the wax slurry that is used in propeller manufacturing at Yamaha Precision Propeller Industries. Showcasing opportunities creates more excitement than just telling students about them. “Whenever we host teachers at our facility and demonstrate the available opportunities for both high-school and college graduates, they leave here amazed,” Kent says. When Yamaha Marine hosted about 100 high-school and college students at its Indianapolis-based Yamaha Precision Propeller Industries plant, the operators were the “star of the show,” says YPPI general manager Jonathon Burns. Integrating hands-on experiences helped engage all the attendees. At the manufacturing-day events, visitors poured molten tin out of a hot pot and into shells to create their own Yamaha keychains. Brunswick-owned Lund Boats used Manufacturing Day to continue its outreach to women, who have been underrepresented in manufacturing. “Beyond targeting students to make them aware of opportunities in manufacturing, Lynda Everson [from Lund human resources] also is reaching out throughout the year not only to students, but also to women in the community to let them know that they, too, are welcome,” says Brunswick Corp. spokesman Dan Kubera. Women make up one of U.S. manufacturing’s largest pools of untapped talent, according to a 2017 report by Deloitte. Women totaled about 47 percent of the U.S. labor force, but only 29 percent of the manufacturing workforce in 2016. Research shows that gender diversity leads to innovation, return on equity, and profitability, according to the report. To reach this untapped workforce, several women at Lund’s New York Mills, Minn., plant were interviewed for a video. Galey’s Marine in Bakersfield, Calif., doesn’t have a service technician shortage, says president and CEO Don Galey. When the company built its new facility, Galey focused on the service department, giving those workers an environment to help them succeed. “So many stores have their service area in the garage or out back by the alley,” he says, adding that the location makes it difficult to move boats in and out. At Galey’s Marine, the lot fits 50 boats, and three tractors pick boats off trailers. There are eight service stalls — one per technician — each with a hoist and perforated systems to catch oil, gasoline and water. Galey’s main technician has been with the company for 35 years; that technician’s father was service manager before his retirement. All are sent to training and technician schools and have regular meetings; if someone is sick midrepair, another can finish the job. When manufacturers come out with new tools or products, Galey’s tries to be the first to order them. All of that goes a long way toward attracting—and keeping—workers, Galey says. “We make sure we do everything that’s possible to make it easier for that technician to do a better job,” he says.